"The Eternal Knot" redirects here. For the 2001 classical album, see Adiemus IV: The Eternal Knot. More complex form seen on ca. 400-year-old Chinese lacquerware dish. The endless knot or eternal knot (Sanskrit: śrīvatsa; Tibetan དཔལ་བེའུ། dpal be'u; Mongolian Улзии) is a symbolic knot and one of the Eight Auspicious Symbols. It is in important symbol in both Jainism and Buddhism. It is an important cultural marker in places significantly influenced by Tibetan Buddhism such as Tibet, Mongolia, Tuva, Kalmykia, and Buryatia. It is also sometimes found in Chinese art and used in Chinese knots. In Jainism it is one of the eight auspicious items, an asthamangala, however found only in the Svetambara sect. It is often found marking the chests of the 24 Saints, the tirthankaras. It is more commonly referred to as the Shrivatsa. 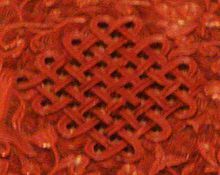 The endless knot symbol appears on clay tablets from the Indus Valley Civilization (2500 BC), and the same symbol also appears on an historic era inscription. The eternal continuum of mind. ^ Beer, Robert (2003). The Handbook of Tibetan Buddhist Symbols (PDF). Serindia Publications. p. 11. ISBN 1-59030-100-5. Archived (PDF) from the original on 3 April 2018. ^ Danino, Michel (2010). Lost River: On The Trail of the Sarasvati. Penguin Books. ISBN 978-0143068648. Wikimedia Commons has media related to Endless knots. "The Endless Knot (Skt. shrivatsa; Tib. dpal be'u)", TwilightBridge.com.